If this passes, we go back to the pre-2012 days of ads that claim a $59 fare and when you go to checkout it is $487 after all fees. 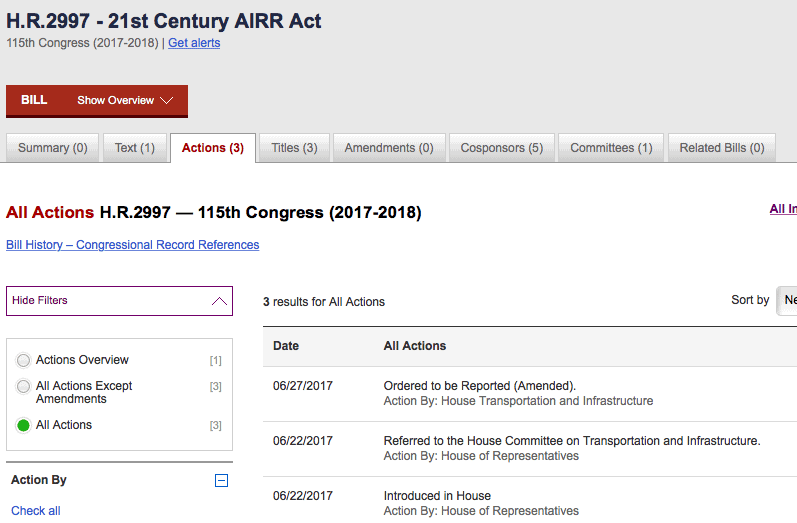 When the bill to ban this practice passed in 2012, Frommer’s declared it a day that would go down in infamy for the airlines. American’s rejoiced. Then Canada passed a similar act. The bill is called H.R. 2997. Read up on it. After you shake your head and lament the fact that our elected leaders work for the big businesses that make campaign contributions and not for we the people, do something about it. Because it’s not easy to decipher, I am posting the full relevant section here. Don’t forget to scroll past it for the rest of the article and what you can do. Bolding is mine. SEC. 505. ADVERTISEMENTS AND DISCLOSURE OF FEES FOR PASSENGER AIR TRANSPORTATION. “(B) the total cost of the air transportation. “(A) IN GENERAL.—For purposes of paragraph (1), the information described in paragraphs (1)(A) and (1)(B) shall be disclosed in the advertisement or solicitation in a manner that clearly presents the information to the consumer. “(B) INTERNET ADVERTISEMENTS AND SOLICITATIONS.—For purposes of paragraph (1), with respect to an advertisement or solicitation for passenger air transportation that appears on an internet website or a mobile application, the information described in paragraphs (1)(A) and (1)(B) may be disclosed through a link or pop-up, as such terms may be defined by the Secretary, that displays the information in a manner that is easily accessible and viewable by the consumer. “(A) BASE AIRFARE.—The term ‘base airfare’ means the cost of passenger air transportation, excluding government-imposed fees and taxes. “(B) COVERED ENTITY.—The term ‘covered entity’ means an air carrier, including an indirect air carrier, foreign air carrier, ticket agent, or other person offering to sell tickets for passenger air transportation or a tour or tour component that must be purchased with air transportation.”. (2) LIMITATION ON STATUTORY CONSTRUCTION.—Nothing in the amendment made by paragraph (1) may be construed to affect any obligation of a person that sells air transportation to disclose the total cost of the air transportation, including government-imposed fees and taxes, prior to purchase of the air transportation. (3) REGULATIONS.—Not later than 120 days after the date of enactment of this Act, the Secretary of Transportation shall issue final regulations to carry out the amendment made by paragraph (1). (B) the date that is 180 days after the date of enactment of this Act. “(B) a prominent link that connects directly to a list of all such fees. “(2) SAVINGS PROVISION.—Nothing in this subsection may be construed to derogate or limit any responsibilities of an air carrier, foreign air carrier, or ticket agent under section 399.85 of title 14, Code of Federal Regulations, or any successor provision.”. Take special note of what I bolded in paragraph B. This bill states that a mobile ad can state only the base fare and then stuff the taxes and fees in a LINK or POPUP!!! So the ad could literally say $49 and then you would need to click a link to see the $400 in taxes and fees. Remember that includes the infamous “YQ” fuel surcharge that airlines can charge regardless of how cheap fuel is and at any amount they desire. If you are in his district, go to Rep. Shuster’s page here and contact him with your thoughts. Contact the hell out of him. If you aren’t, contact your local representatives and tell them that you think this part of HR 2997 needs to go. I’d also like to hear what you think in the comments below or on the Facebook group. Do you prefer to have to comb an ad with a fine tooth comb to know the actual price? Or do you prefer to, you know, just SEE IT?